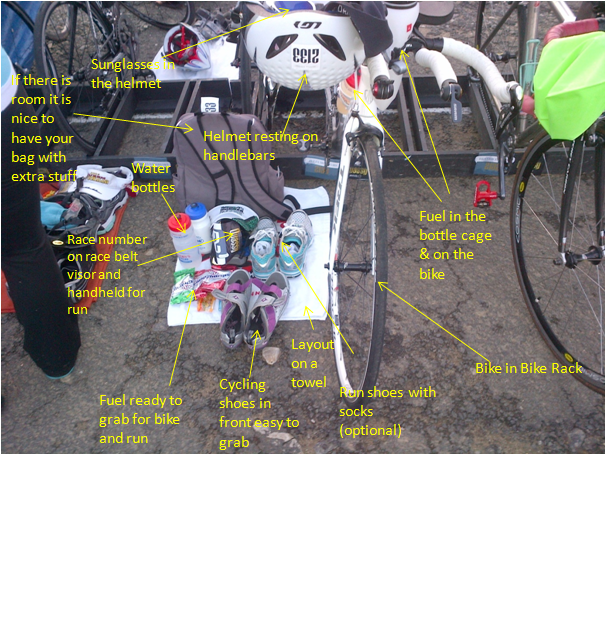 To continue the rest of my Basic Triathlon advice from my last blog here are some of the gear I would recommend, a basic race day and a transition layout. Get to the race early to set up transition. 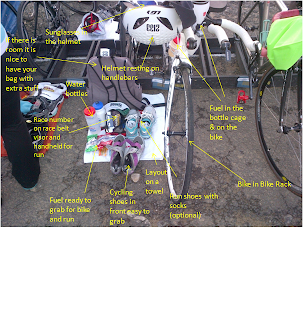 Some races designate your transition spots others you must put your bike (rack) within a certain area. Do your best to keep yourself in a small area to the left or right of your bike on a small towel. In your transition area you will want your biking equipment and run equipment since this is where you will return switching between sports. Don’t leave your swim equipment in transition take that with you to the swim start. Make sure you put the chip for timing on your LEFT leg so it doesn’t get caught in your bike gears. Always make sure to make a mental note of how to get to your transition spot from the swim exit and where the exit for the bike is, note where you will be coming in off the bike and where to go out for the run. Swim- generally wave start based on age groups or divisions. Caps generally designate waves and are given in gear bags on race morning. Some starts are from the edge of the water some start in the water, depends on the race. Generally the swim has bouys to “sight” for the course, sighting is lifting your head while swimming to see where you should be headed. There is no requirement for the stroke you swim in a triathlon. Generally freestyle (crawl), breast stroke and backstroke are seen. Make sure you swim around the bouys. Drafting is okay in the water and can really help you use less energy. There are always people in the water to help- so look for them before you start. You can rest on kayaks and anyone there to help they just can’t help you advance in the swim. Upon exiting the swim generally there is short run up a beach to transition. As you run take off wetsuit if you are wearing it and remove cap and goggles so when you are in transition you are ready to put them in your area. DO NOT drop anything- it is a penalty. Put on your bike shoes if you are wearing them or your sneakers. Find out if the race requires wearing your number on the bike- if so put it on your race number belt with it on your back. Make sure you put on your helmet and clasp it before you run with your bike out of transition. NOTE: you are NOT allowed to mount your bike until you reach the marked MOUNT line. So run with your bike next to you until you reach that line. Bike- rules play a big part in the bike. Make sure you never cross the double yellow line in the road and always follow the rules of the road keeping right. Do yourself a favor and learn how to change a flat tire for road racing. Try to maintain a good line on the bike. Learn the passing rules for your race. It is always best to say “on your left” when you are passing someone. When you come into transition for the run, make sure you slow down for dismount- it is usually really congested. Even consider dismounting earlier than the dismount line so you are off your bike out of the way. Take your bike in your hand and run into transition with the bike. Best to leave your helmet on until you rack the bike again. Put the helmet back on top of the bike. Switch shoes if needed, and put on a visor or a hat generally for the run. Make sure you put on your race belt with your number flipped to the front (you want to get those race photos!) And put on those running shoes and do what comes natural- RUN the course! I carry water with me on half iron distance races anything shorter I don’t. Always be sure to cheer for everyone else on the course. A simple “nice job” goes a long way. Traithlon unlike many other racing communities is very supportive of others on the course. Just so you know- there really is no place to go to the bathroom on a course usually- except on longer distance events. Transition almost always is your spot with a port-a-potty. In Ironman distance events age group athletes usually choose to change their clothes between events in changing stations. In shorter distance events there is no place to change. So plan your race outfit for the duration. For shorter distances, I generally will wear a sports bra and 1 piece tri outfit. Longer distance I am worried about having to hit the bathroom on the course I go with a sports bra, tri top and bottoms- easy escape for the bathroom stops. Try to stay contained to a small area. You will notice no swim stuff is in the transition set up since you need to use it. This is a set up from a 70.3 a shorter distance event will likely have less stuff.